Last night I went to see Jon Anderson in solo concert at the Royal Exchange Theatre in Manchester. 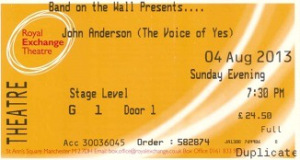 The show was billed thus: “Frontman of one of the biggest bands of all time, Jon Anderson brings his stunning voice and exquisite songs to Manchester’s Royal Exchange Theatre for this very special solo performance. Expect a magical night that draws from the YES songbook and includes all-time classics such as Owner Of A Lonely Heart, Wonderous Stories, Long Distance Runaround, and Yours Is no Disgrace.” The venue sounded interesting and lived up to its description on the Royal Exchange site: “The Royal Exchange Theatre is a seven-sided, glass-walled capsule, literally suspended from huge marble pillars situated in The Great Hall of the historic Victorian Cotton Exchange Buildings in Manchester city centre. The unique design means all seats are less than nine metres from the circular stage giving views from all angles.” I arrived around 7pm after a uneventful drive down the A1 and across the M62. For the full review, please visit the Vintagerock website! This entry was posted on Thursday, August 8th, 2013 at 00:00	and posted in Jon Anderson, Review. You can follow any responses to this entry through the RSS 2.0 feed. « New CD Release By Vocalist Murray Hockridge & Guitarist Dave Kilminster ‘Closer To Earth’ Now Available!